FOSTER UPDATE: Niles is a sweet boy with a charming personality. He gets along famously with adults, children and other dogs. Well behaved in the home, Niles has not exhibited signs of separation anxiety when left alone for a couple of hours. Niles is fearless of unusual loud noises and is a born car traveler. He is the consummate communicator who barks, whines and howls; however, consistent ongoing gentle training will help Niles recognize when this behavior is appropriate—such as a burglar! Niles is house trained but he really prefers to do his business on his walks. He would do best with a family that exercises early in the cool morning hours. Niles has advanced arthritis in his right rear leg. He may need to take daily medication. Therefore, Niles cannot run at the doggie park, is restricted to two short daily walks, and needs to be lifted in and out of the car. 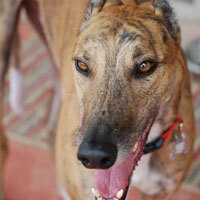 This beautiful boy needs someone that’s greyhound savvy with a big heart.